OTTAWA—The Liberal government’s first budget takes a swing at shrinking Canada’s growing inequality and boosting the middle class. Progressives call it a step in the right direction, the Conservatives decry its deficit, and Parliament’s former finance watchdog wonders what it will really add up to. Criticism over the projected $30 billion deficit is predictable and debatable, but the vagueness of who the budget serves is a different problem. The government has declined to define—in a quantifiable way—who the middle class is. Nearly every Canadian thinks they are middle class, but it’s a much smaller group that benefits from signature measures like the soon-to-be-passed middle class tax cut. That’s a problem for a budget titled “Growing the Middle Class,” according to former parliamentary budget officer Kevin Page, the man once charged with giving Parliament an independent view of the nation’s finances and federal estimates on programs. “It makes it hard to understand what are they going to achieve in this budget,” Page said in an interview. Page suggests the government could indicate an income level or certain characteristics to describe who it is targeting. Liberal MP Rob Oliphant said defining “middle class” is easier said than done because of significant regional variations in Canada. Using indicators like income or home ownership are complicated when a house in Saint John, New Brunswick, costs a fifth of one in Vancouver. “It is almost art, not science, to figure out what the middle class is,” Oliphant said. 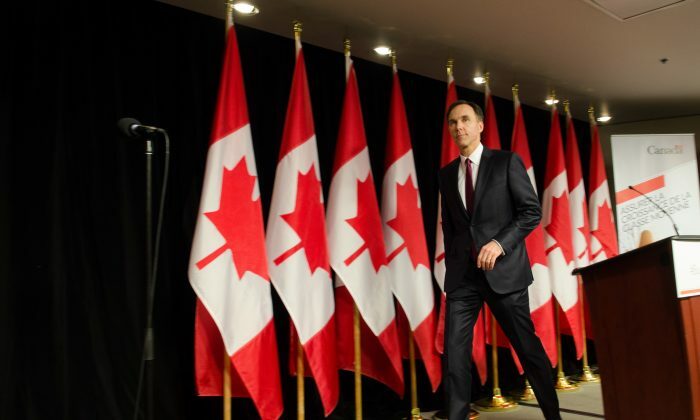 Many have asked Finance Minister Bill Morneau to define “middle class.” He usually sidesteps the question, but on March 22 during a budget press conference he told the Epoch Times it refers to people struggling to maintain a decent quality of life. “What does the middle class mean? It means those people who are worried they’re not going to have a job for 20 years. Unlike the generation before, they can’t expect a 20-year job,” he said. Morneau said such Canadians are struggling with increasing costs and haven’t seen incomes rise significantly in 30 years. It isn’t the kind of definition Page was looking for, nor is it the kind of term that economists and auditors can measure against, though it does align with how many Canadians understand it. But that gets confusing for the Liberals’ progressive allies when the 2 percent tax cut for those making $45,000 to $90,500 is deemed a “middle class tax cut” but has no impact on those making the national median (around $30,000). Morneau has said the cut will benefit 9 million Canadians by an average of $330 a year for individuals and $540 for families but only those making upwards $90,400—the top 10 percent—will see the most benefit, according to the Canadian Centre for Policy Alternatives (CCPA). It definitely benefits the richest Canadians the most. “It definitely benefits the richest Canadians the most,” notes CCPA senior economist David MacDonald. Oliphant said the tax cut needs to be seen within the context of the budget’s other measures, like the Canada Child Benefit. The child benefit is one of the budget’s most lauded measures. It is tax free and delivers higher payments to low-income parents and tapers off to nothing for those making close to $200,000. It replaces three existing programs, including the former Conservative government’s Universal Child Care Benefit, which delivered a flat payout regardless of income level. Rather than trying to measure impacts on certain income brackets, Oliphant said the budget should be judged qualitatively. The test becomes, do most people feel worse off, the same, or better off after this budget has taken place. Oliphant admits that is an ephemeral evaluation, but perceptions matter, he said. Oliphant added that the only objective measure that really matters is broad economic performance over the next three years. The Liberals have high ambitions for their new mandate. Growing the middle class requires bucking global trends that have seen a hollowing out of middle incomes as manufacturing jobs disappeared. Today’s middle income jobs require ever higher and ongoing education. The Liberals are trying to meet that need by increasing the non-repayable Canada Student Grant by 50 percent—from $2,000 to $3,000 for those from low-income families. It’s a move praised by the country’s two largest student groups. But bucking larger trends, like burgeoning household debt, will be difficult. The Bank of Canada has kept interest rates low to spur borrowing in an effort to meet its inflation target, but that led to Canadians borrowing record amounts. The problem is severe enough that in March last year the International Monetary Fund warned that Canada needed better oversight to avoid systemic risk to the financial system. It is also affecting how Canadians feel, said Page. The budget addresses that in part by trying to lower expenses for Canadians by increasing supports through social programs. The Liberals also pledged to make the most wealthy pay more. That includes a new top tax bracket of 33 percent on income above $200,000. More important are budget measures to strengthen the Canada Revenue Agency. The budget allocates $440 million over five years to help the Canada Revenue Agency go after tax evasion and avoidance. “That’s pretty good,” said Dennis Howlett, executive director of Canadians for Tax Fairness. The CRA also gets $351.6 million over five years to better collect outstanding tax debts. Combined, the two measures are expected to add $10 billion to government revenues over five years. But progressive groups like Howlett’s are disappointed the Liberals abandoned a soft promise to fully tax stock option gains over $100,000. “That’s $1 billion going to the top 1 percent CEOs. It’s the most egregious tax loophole of all,” said Howlett. Morneau cancelled the plan after an outcry from startups who use stock options to recruit talent. That decision shows the impossible balance any government must seek: funding social programs Canadians want amidst a shaky global economy and an almost ingrained opposition to higher taxes. Deficits and tax hikes will be catnip for the opposition Conservatives, and the Liberals will have to work hard to prove both really help the economy. That becomes doubly true when deficits, like this one, have no end in sight. Page said the tax cut, employment insurance improvements, Canada Child Benefit, and other programs do not seem to be covered by current revenues. From that perspective, the Liberals have taken a gamble. They need to pay for the programs they pledged to Canadians without going too far in the red. That means growing the economy, raising taxes, or finding other savings. Only economic growth is universally welcome. If the government has to resort to tax hikes or spending cuts, Trudeau’s honeymoon with the electorate could end sooner than he’d like.